Vermont Aged Care is seeking an experienced Cook for a full-time position at our expanding aged care facility. In fact our busy, family owned aged care facility has been providing respite, permanent, dementia specific and palliative care to our residents for over 3 decades. So, you’ll be joining an established team of committed professionals. Better still there’s no “nursing home” attitude at Vermont Aged Care, and no “nursing home bland food” on offer. That’s because we have a passion for the quality of life and happiness of each one of our elderly residents. Of course, food is a BIG part of that, so if you want to work with a dynamic, passionate team of dedicated carers then this job is for you! Best of all, you’ll get to work closely with other staff and our family. This means that you can make a real difference in the lives of our residents everyday. Plus, your input is valued and you have the power to make positive changes. Together, we can ensure our residents receive the best and most nutritional food possible. Furthermore, did you know that Vermont Aged Care is located in Vermont, near to Mitcham, Burwood, Ringwood, Glen Waverley, Wheelers Hill, Wantirna, Blackburn and Box Hill? Better still, we are easily accessible by road and public transport. In fact, the 740 and 742 buses stop right out front of our door! What’s more we are undergoing major additions and improvements to our facility in 2017, including modernising our food production facilities. Of course, this is set to the sides of the existing facility so no one is disrupted. Nonetheless, when completed in the coming weeks we will be able to provide the latest technologies and facilities to each of our residents. Please see the full job details below. What does that mean for you? Well, you’ll have a direct input into our menus and nutritional direction every day. That’s why at Vermont Aged Care you’re not just “the cook”! In fact, you’re a key part of the health services we provide. Who will I be cooking for and working with? You will be providing nutritional meals for the Residents of Vermont Aged Care. These residents may be here for respite care, dementia support, long-term aged care or palliative care. That means that their nutritional needs will vary, making your work more interesting. Also, we strongly support cultural choices so you’ll be creating a diverse range of foods. Finally, you will be working in a friendly team, at a family operated facility where management support is always on hand. of people. In fact, due to the nature of the role, you must have this qualification to be considered for this post. Also, if you have previous experience cooking specifically for the aged, frail or those requiring special diets, that will be well regarded. Also, we are happy to discuss supporting your commitment to further education and training. That’s because ongoing learning is highly valued at Vermont. Why not work at Vermont Aged Care and and learn new, valuable skills too? We pay as per the award based on your experience and qualifications. We may also support your ongoing training. Better still, if you want to discuss a career plan so we can all keep improving together just let us know. Ongoing learning is supported at Vermont Aged Care. The quality and nutritional value of our meals is paramount to our service. Further, it’s important to provide a diverse diet to our residents. This is both to respect cultural preferences as well as ensuring residents maintain a healthy intake of nutrition. Can you describe my position as a Cook? Attend the annual Fire Safety lectures etc. 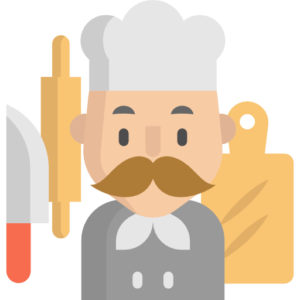 We will support you in the maintenance of knowledge and skills in food preparation and elder care. Further, on some of your shifts you will attend regular lecture sessions as provided by one of our staff of off-site specialists. Better still, off-site training and events may be provided to you as required. In fact, these are just some of the ways in which we ensure our continuing commitment to your further education is promoted. You will learn more if you are shortlisted for an interview. Of course, with palliative care sensitivity and compassion are paramount. An important part of your role will be to ensure that you will provide appropriate meals to residents, their families and visitors to ensure a peaceful and dignified death. Overall, you are a very important part of our residents’ care and happiness. Rest assured, we appreciate the importance of this role in providing good food for elderly people.